Brian Hoggard’s book Magical House Protection – The Archaeology of Counter-Witchcraft will be launched in Pershore, Worcestershire on Sunday 30th June. Join Brian and other enthusiasts at St Andrew’s Parish Centre. Church Walk, Pershore, WR10 1DT. 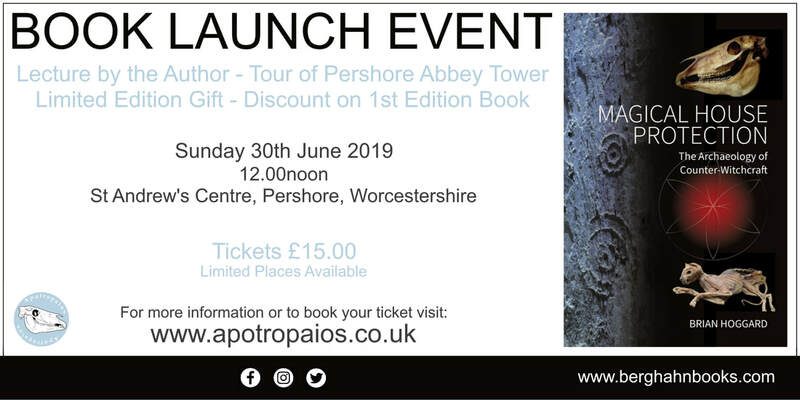 Every attendee will receive a limited edition numbered enamel badge of the Apotropaios logo and the hard cover first edition of Brian’s book will be available to purchase at 25% discount (only available to attendees on the day). Brian will give a one hour lecture on the subject of magical house protection and there will be time for questions afterwards. Brian will also be happy to sign any books purchased on the day. There will also be tours to see the fascinating historical graffiti in Pershore Abbey’s tower led by Brian, which includes access to two areas not normally included in the tour. The tours have a maximum of 12 on each and a certain level of fitness is required to cope with the steps and narrowness of some of the passages. More details of the even can be found here on Brian’s website Apotropaios, which also contains a wealth of fascinating information on this subject.